The Samsung Galaxy Tab 2 has been announced ahead of MWC 2012, with the Korean firm rebooting the chassis of its first tablet. The new tablet features a 7-inch screen to cater for the smaller tablet lover, but more importantly is running on Ice Cream Sandwich (or Android 4.0) and may well be the first from the company to bring the next generation platform. The rest of the technical specs are less exciting: we're looking at a 1GHz dual core processor running under the hood, with a 3MP camera on the rear. Samsung has overlaid the Ice Cream Sandwich platform with its own TouchWiz UI too, and video calling will be supported through a VGA front-facing sensor. The screen might not be too shabby it seems, as while it's 'only' LCD (rather than the fancy-pants Super AMOLED offerings from the Korean firm) the resolution of 1024x600 should be enough to keep users complaining of fuzzy displays. Other key specs that don't seem to have moved things on much in a year and a half include: 1GB of RAM and the choice of up to 32GB internal memory. Intriguingly, Samsung is referring to the device as the Galaxy Tab 2 (7.0) in its press materials, so it seems likely we'll be getting larger variants of the same device in the same way as the Motorola Xoom 2 has been offered. Thomas Richter, Samsung's director of portfolio management, told TechRadar: "Since 2010 we have been bringing the Galaxy Tab range. In 2012, we believe that people want to experience more on the go." 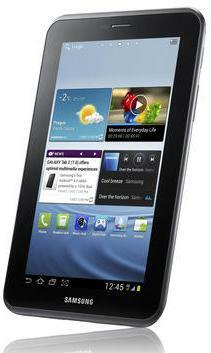 The Samsung Galaxy Tab 2 UK release date has been set for March, so expect to see our full review up any time soon.